President Barack Obama’s Sunday night “address to the nation” on last week’s mass killings in San Bernardino and the response within the political and media establishment demonstrate that, once again, a tragic event is being used to disorient and browbeat public opinion in order to drag the American people deeper into war. Obama was on the defensive, seeking to fend off attacks on his Syria policy from the Republican right and elements within his own party who are braying for even greater violence and bloodshed. The speech took place within the context of an explosive escalation of the war in Iraq and Syria last week, beginning with the US administration’s announcement of a Special Forces detachment to conduct combat operations and followed in rapid succession by votes in the British and German parliaments authorizing military operations in Syria. The hysterical response of the US media has been wildly disproportionate to the scale of the San Bernardino attack, as tragic as it was. As Obama acknowledged in his Sunday speech, the US is a country where mass killings are “all too common.” Over the past year they have occurred on an almost daily basis. Since the 9/11 attacks, 200,000 people have been killed in homicides. Forty-five people have been killed in attacks attributed to Islamic extremists, but a greater number, 48, have been killed by white supremacists and other right-wing extremists. Far more people were killed by the Oklahoma City bomber, Timothy McVeigh, a right-wing veteran of the 1991 Gulf War, than the 14 killed last week by Syed Farook and his wife Tashfeen Malik. Just last month, three people were killed and many more wounded in an attack on a Planned Parenthood facility by an anti-abortion fanatic. The major difference in last week’s shootings was the religious background of the perpetrators. Indications that what had the earmarks of a typical workplace shooting in America may also have been motivated by outrage over US-led wars in the Middle East and support for ISIS were seized upon by the media to launch a non-stop, mind-numbing barrage of fear and warmongering. This attempt to revive the 15-year “war on terror” is being carried out despite the fact that there is no evidence, as Obama acknowledged in his Sunday speech, that the San Bernardino attack was directed by any terrorist organization or part of a broader conspiracy. The orchestrated media campaign is in support of powerful factions within the American ruling class and state that have seized on the San Bernardino tragedy, coming on the heels of last month’s mass killings in Paris, to effect a reversal of Obama’s policy of avoiding a large-scale US combat role in Iraq and Syria. The Wall Street Journal spoke for these factions Monday in its editorial on Obama’s speech, in which it called for the deployment of at least 10,000 US Special Forces to Syria to spearhead the war for regime-change against President Bashar al-Assad. The drumbeat for military escalation is not driven by sympathy for the victims of the San Bernardino attack or moral revulsion over the actions of the perpetrators. It is the result of a calculated decision to utilize the event to overcome growing popular disaffection and opposition to war, after 15 years of non-stop military aggression, and intensify the reign of imperialist violence in the Middle East. It is also a fact that America is too democratic at home to be autocratic abroad. This limits the use of America’s power, especially its capacity for military intimidation. Never before has a populist democracy attained international supremacy. But the pursuit of power is not a goal that commands popular passion, except in conditions of a sudden threat or challenge to the public’s sense of domestic well-being. Such is the method behind the current media madness, and it is being employed as well in France, Britain and Germany. In the US, it has reached truly demented proportions, including Bush administration Attorney General Michael Mukasey comparing the attack in San Bernardino to the Japanese bombing of Pearl Harbor! Of course, there was no suggestion that the living hell inflicted by US imperialism on the mainly Muslim and Arab masses of the region had anything to do with the growth of terrorist organizations. 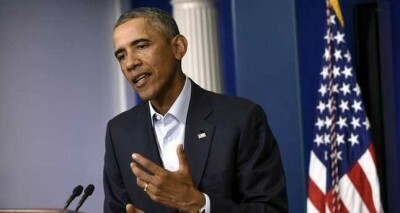 Nor did Obama mention that the US and its regional allies, including Saudi Arabia, where the San Bernardino killers spent considerable time, directly armed and supported ISIS and other Islamic fundamentalist forces linked to Al Qaeda in their drive to overthrow the regimes in Libya and Syria and install puppet governments. But he rejected “a long and costly ground war in Iraq or Syria,” and this goes to what the media hysteria over San Bernardino is really about. It is part of a bitter and protracted dispute within the ruling class and the state over the focus of US imperialist foreign policy. The neo-cons and others consider Obama’s decision to pull back from the planned air war against Syria in 2013, prepared on the basis of lying claims of a Syrian government chemical weapons attack outside Baghdad, an unforgivable blunder. All the more so in that it was accompanied by a deal with Russia that effectively shielded Russia’s ally Assad for a period and was followed by the nuclear agreement with Iran. These forces, both outside and within the military and intelligence apparatus, want nothing less than a full-scale war to turn the Middle East, including Iran, into a US protectorate. They also want the US to give unqualified support to Netanyahu’s plans for a Greater Israel, and they want to escalate the confrontation with Russia to the point of war. Obama’s foreign policy emphasis, from the time he came into office, has been different. He speaks for those factions that want to focus US military resources on the encirclement and isolation of China, in preparation for a war to dismember the country and reduce it to neocolonial status. He sees another large-scale war in the Middle East as undercutting that more critical agenda. This dispute has been building in recent months, with a flood of think tank reports and commentaries excoriating Obama for backtracking in the Middle East and demanding a reversal of his policy. These policy disputes represent tactical differences about the pursuit of US imperialism’s geostrategic agenda of global hegemony. But they are substantial differences. That said, there is no peace faction within the US political establishment or state, or within the Democratic Party. Both orientations lead to catastrophe. The working class must reject with contempt the latest media campaign for a wider war and resolutely oppose all factions of the ruling class. It must mobilize its strength internationally to put a stop to imperialist war by putting an end to the capitalist system that breeds it.